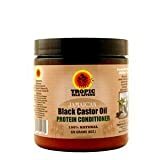 Tropic Isle Living’s Hair Food is formulated with Jamaican Black Castor Oil and natural plant wax. It’s fortified with cactus oil, shea butter, grape seed, aloe vera and other natural hair friendly ingredients. Jamaican Black Castor Oil Hair Food helps your hair grow thicker, longer and fuller. It moisturizes, adds sheen and get rid of dry frizzy hair. Use daily in your hair care regiment. Black castor oil has an age old reputation as an all purpose healing oil. It’s commonly used for hair and scalp problems, skin conditions, aches and pain, laxative, breast massage, fibroid, first aid, for cuts and wounds, burns and much more.